The DPG8000 Series is being superseded with a redesigned model, which has all the features of the DPG8000 plus some additional features. Please see the new model, DPG8001, for complete details, or contact our Pressure department for more information. The DPG8000 series digital pressure gauges offer 1/4% full scale accuracy in a rugged, easy-to-use unit at prices comparable to mechanical test gauges. All stainless steel wetted parts make it suitable for a wide variety of liquid or gaseous media. This product features user-selectable units of measure allowing one gauge to be used for a variety of pressure scales. 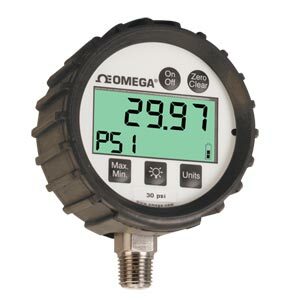 The DPG8000 comes standard with many features that are either not available or offered only as options on many competitors’ digital gauges such as backlight, peak hold and a four-digit display. 참고: All DPG8000 series gauges come with protective rubber boot, batteries, and complete operator’s manual.